Westminster City Council is the local authority for the City of Westminster in Greater London, England. It is a London borough council and is entitled to be known as a city council, which is a rare distinction in the United Kingdom. The city is divided into 20 wards, each electing three councillors. Following the 2010 elections, the council is composed of 44 Conservative Party members and 16 Labour Party members. The council was created by the London Government Act 1963 and replaced three local authorities: Paddington Metropolitan Borough Council, St Marylebone Metropolitan Borough Council and Westminster City Council. The borough council provides some shared services with Hammersmith and Fulham, and Kensington and Chelsea. There have previously been a number of local authorities responsible for the Westminster area. The current local authority was first elected in 1964, a year before formally coming into its powers and prior to the creation of the City of Westminster on 1 April 1965. Westminster City Council replaced Paddington Metropolitan Borough Council, St Marylebone Metropolitan Borough Council and the Westminster City Council which had responsibility for the earlier, smaller City of Westminster. All three had been created in 1900, with Paddington and St Marylebone replacing the parish vestries incorporated by the Metropolis Management Act 1855. 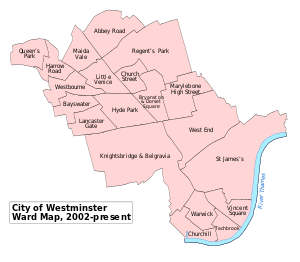 Westminster itself has a more convoluted history and the metropolitan borough council established in 1900 had replaced the Vestry of the Parish of St George Hanover Square, the Vestry of the Parish of St Martin in the Fields, the Strand District Board of Works, the Westminster District Board of Works and the Vestry of the Parish of Westminster St James. It was envisaged through the London Government Act 1963 that Westminster City Council as a London local authority would share power with the Greater London Council. The split of powers and functions meant that the Greater London Council was responsible for "wide area" services such as fire, ambulance, flood prevention, and refuse disposal; with the local authorities responsible for "personal" services such as social care, libraries, cemeteries and refuse collection. This arrangement lasted until 1986 when Westminster City Council gained responsibility for some services that had been provided by the Greater London Council, such as waste disposal. Westminster became an education authority in 1990. Since 2000 the Greater London Authority has taken some responsibility for highways and planning control from the council, but within the English local government system the council remains a "most purpose" authority in terms of the available range of powers and functions. The local authority derives its powers and functions from the London Government Act 1963 and subsequent legislation. Westminster has the powers and functions of a London borough council. It is a billing authority collecting Council Tax and business rates; it processes local planning applications; it is responsible for housing, waste collection, and environmental health. It is a local education authority responsible for social services, libraries and waste disposal. The council shares responsibility with the Greater London Authority for strategic policies including housing, planning and the environment. Westminster City Council is the billing authority for Council Tax, and collects a precepts on behalf of the Mayor's Office for Policing and Crime, the London Fire and Emergency Planning Authority, the Greater London Authority and Transport for London.